As I was leaving Cosmoprof North America Las Vegas this summer, I ran into a booth called NOYA where I met two lovely people - Sarah and Josh. They wanted to know if I'd like to try their all natural, kosher-certified lip balm. 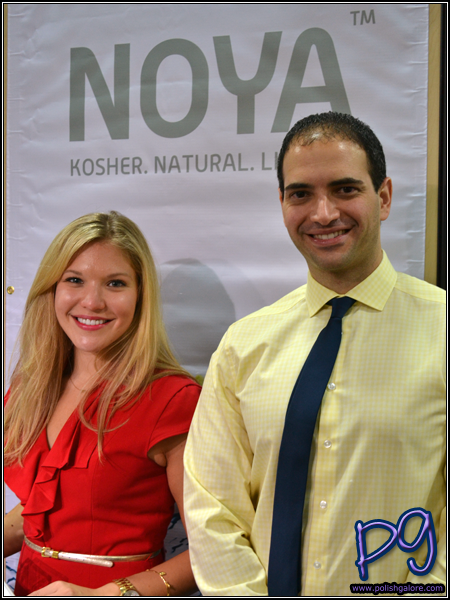 Unlike many products on the market, NOYA only has 3-5 kosher ingredients - all that you can pronounce and recognize: Extra virgin organic olive oil, coconut oil, beeswax and natural flavor. NOYA is free of all preservatives (parabens, sulfates etc), safe to use on any skin type, not tested on animals and working on developing eco-friendly biodegradable packaging as well. NOYA currently comes in 4 flavors - Cherry, Spearmint, Vanilla and Classic (unflavored). When I originally told Sarah that I was a nail blogger, not a makeup blogger, she told me that I could use NOYA as a cuticle balm so I grabbed a Classic for the road. Fast forward to now: I've been sick for a few weeks now (again) and one of the first things to go on me is my lips. They are cracked, sore, and not pretty. That's when I remembered I had my tube of NOYA in my bag. I put it on and immediately felt some relief. Between the oils and the beewax, it keeps my lips soft as I try and re-hydrate myself. The tube is no bigger than a tube of Chapstick, so it fits well into a pocket or purse (net wt 0.15 oz). The lid is slightly grooved for a tight fit, which is big for me because I tend to throw it in my purse and I have other brands that have lids that just slip off constantly. My only complaint is that I don't prefer the unflavored - so I purchased the other 3 this evening. Edit: After a reader commented that the shipping/tax was too much for one tube, I did some searching and found this image on their website. So if you want free shipping, you can buy 3 tubes (I recommend all the flavored ones!) and then you don't pay shipping! NOYA [Website | Facebook | Twitter | Pinterest | Google+] can be found in over 100 stores in the USA or purchased on this website for $3.99 a tube. After reading your post I visited the site and was about to buy myself a tube of the Spearmint flavour only to discover that the cost of shipping + tax is actually more expensive than the balm itself. Not very cost effective, unfortunately, so I'll be waiting to see if it shows up in my local stores. You're kidding?! How much was it? For 3 tubes, I paid 80 cents tax and no shipping, so I wonder what the difference was? They also have a store locator so you can see what stores are closest to you.